Stock Trainer is a virtual stock trading application for Android with real and live world market data. The app uses real markets and their data to help beginners make their first steps in the world of stock investment. Users are provided with virtual money to trade stocks and get an understanding of how stock investments work. Learn trading with our real market app and use it as a guide for your future investments. Stock Trainer supports 13 countries and over 20 different stock exchanges. We are continously working to add more countries on our platform and enhance stock analysis offerings in the app. ... and the best part - Stock Trainer app is absolutely free. Register to use Stock Trainer using your email address or sign up using your social network login. Upon registration you'll receive virtual investment money using which you can start your journey towards stock investing. Find the stocks that you want to invest in using company name or ticker symbol, or by utilizing stock research tools provided in the app. Stock research tools include list of top losers and gainers, insider trades, and analyst recommendations. 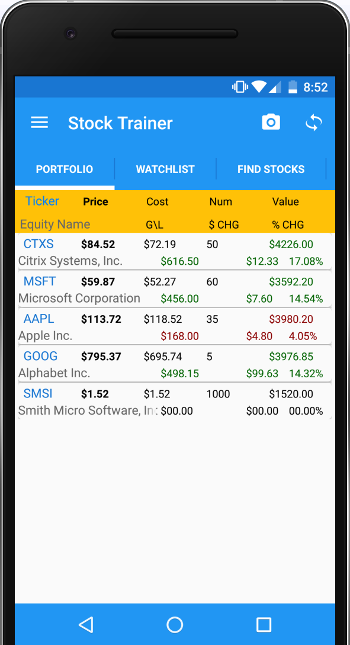 Click on a particular stock on any screen within the app to launch stock data screen. Stock data screen shows detailed information on the stock along with stock charts with various time span options. Double tap on any chart to go full-screen, and add technical indicators overlay on the chart to analyze it. Stock Trainer is a mobile product owned and developed by A-Life Software. Stock Trainer is used by a leading business school for their annual stock trading competition with hundreds of participants involved in virtual stock trading. Stock Trainer is platform of choice for a well known brokerage firm for real trading using their trading platform. Live trading on Stock Trainer app is coming shortly. A-Life Software has a strong focus on developing mobile solutions related to stock trading. We have more stock investment related apps in the works, so stay tuned for upcoming apps. Please understand that investing in stocks is considered as speculative investment. Your success or failure at investing in stocks within Stock Trainer does not guarantee similar results when you invest with real money using other applications, websites and platforms. Stock Trainer app should not be considered as a formal or legal training for stock market investments. No results – good or bad – are guaranteed if you use this application. The developer of this app does not make any claims that you will be successful or profitable at stock market investments. Please be aware of the risks involved in stock investing, and you use the material contained herein at your own risk. Neither the developer nor any of their partners guarantee its accuracy or validity, nor are they responsible for any errors or omissions, which may have occurred. The analysis, ratings, and/or recommendations made by this application, and/or any of its partners do not provide, imply, or otherwise constitute a guarantee of performance. Accuracy and completeness cannot be guaranteed. You should be aware of the risks involved in stock investments. It should not be assumed that future results will be profitable or will equal past performance, real, indicated or implied. The material on this application is provided for information purpose only. The developer of this application does not accept liability for your use of the application. The application is provided on an “as is” and “as available” basis, without any representations,warranties or conditions of any kind. By using this application you give your consent to not hold the developer responsible for any loss in stock market / investments, and waiver your right to a litigation or a law suit against the developer. If you do not agree with this disclaimer then please stop using Stock Trainer application and uninstall it right away. this website and for Stock Trainer app. © 2016 Stock Trainer by A-Life Software.